Chairman of CANbridge Life Sciences Ltd.
Dr. James Xue is a veteran entrepreneur with extensive experience spans from US to China and from small biotech to multi-national biopharmaceutical companies. 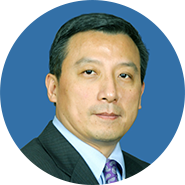 Over the last two decades, Dr. Xue led or was involved in several start-up companies and situations as well as managed sizable business and operations that contributed to his unique insight and deep knowledge in the biotech industry. In 2012, Dr. Xue founded CANbridge Life Sciences Ltd, a ventured-back clinical-stage bio-pharmaceutical company focusing on developing and commercializing innovative oncology treatments/rare disease to address highly unmet medical needs in China and Asia. Prior to CANbridge, he was a senior executive at Genzyme where he spent 10 years in various managerial positions with increasing responsibilities. For five years he was founding general manager of Genzyme China during which he managed the launch of several life-saving drugs for the treatment of hematologic cancer and rare metabolic diseases in China including Thymoglobuline® and Cerezyme®. Dr. Xue holds a B.S. in Pharmaceutical Chemistry from Peking University School of Pharmacy, a Ph.D. in Bioorganic Chemistry from Brown University and a M.B.A. from Darden School of Business, University of Virginia.